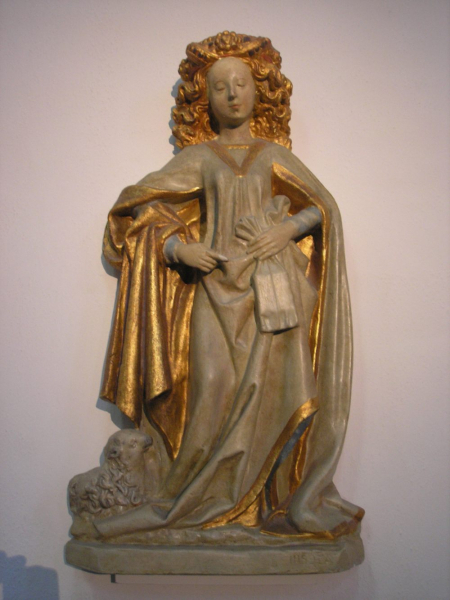 The present instrument incorporates parts of an earlier organ, namely the 1569 - 1571 Peter Janszoon de Swart renaissance organ. From this famous and capable organ builder 6 stops in de Rugwerk, 3 in the Bovenwerk, and 2 in the Pedal still remain in the instrument. Notably the plenum formed by octaaf 4 and 2', the quint 3' and the two mixtures in the Rugwerk are from de Swart. In manufacture as well as in sound quality these pipes are the best of the organ. 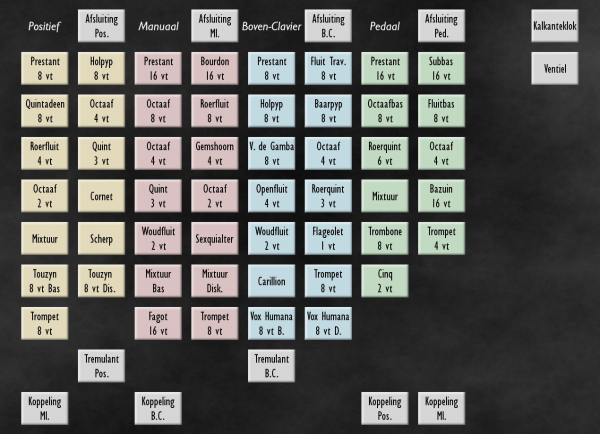 Due to the usual compass of instruments in the 16th century the old pipes are basically in the region F, G, A - f#2, a2, the remainder made new in1640, 1709 and 1831. 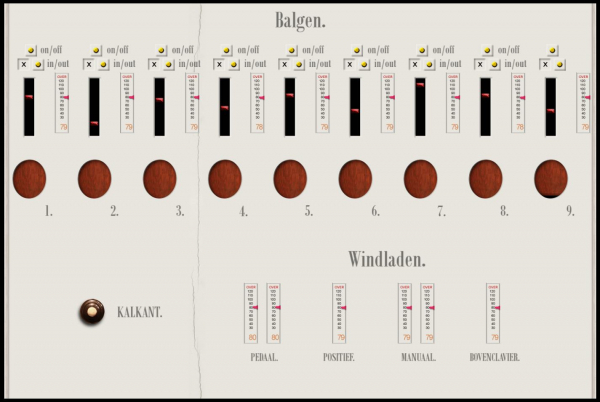 The Bätz organ company, one of the leading organ builders in the Netherlands during the 18th and 19th century, built a totally new instrument as we see it today in its present form, while using several old stops, as indicated above. 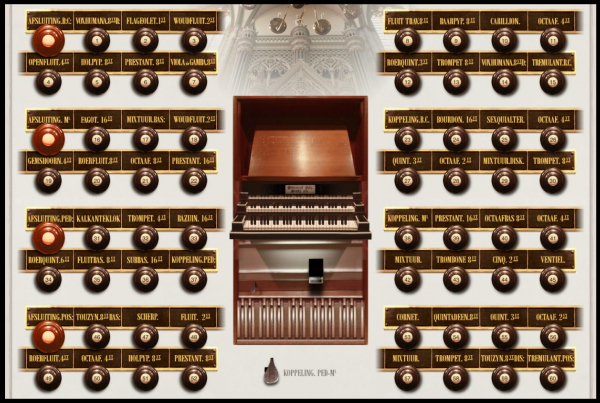 Nevertheless the company created an organ in the style of the early 19th century, while the architect of the church, Tieleman Franciscus Suys from Brussel, Belgium designed the case and ornaments as well as the new chamber for the 9 wedge bellows. The case is neo-classic, with gothic elements for the ornaments. 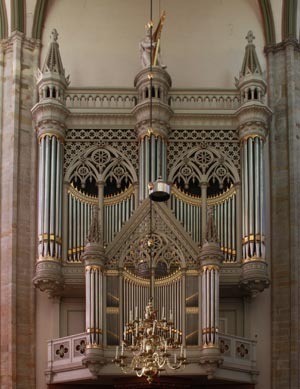 The organ itself is built in such a way that all parts such as pipes and mechanism can easily be reached. The famous French organ builder Cavaillé-Coll expressed his admiration for the spacious layout during a visit in november 1844. In 1865 the successor of Bätz, C.G.F. Witte exchanged the sexquialter of the Hoofdwerk for a Cornet 5 ranks and in 1895 this company revoiced all the reed stops. During the period between 1911 and 1936 the Tousijn 8' en Fluit 2' on the Rugwerk were removed, there was a renewal of the HW Trompet 8'. The Gemshoorn 4' and Woudfluit 2' were also removed and a swell box for the Bovenwerk was added. On the Bovenwerk the Roerquint 3' and Vox Humana 8' were exchanged for romantic stops, and finally in 1935 the bellows chamber was demolished and in the relatively shallow organ case a new wind supply was improvised. 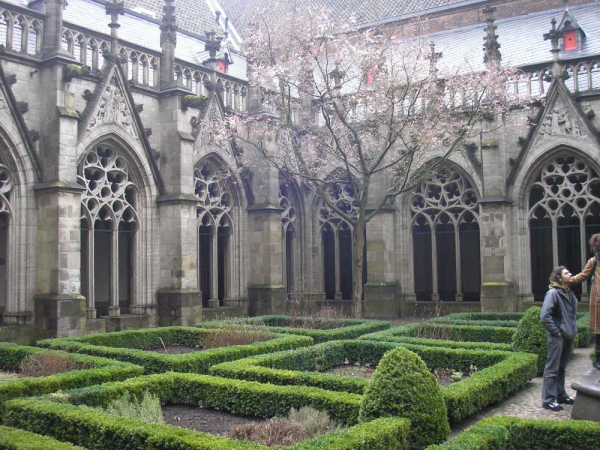 During the 1972-73 extensive restoration by Van Vulpen, the experts in maintenance and restoring Bätz organs, the stops removed earlier were reconstructed. A new wind supply system with six regulators was built within the main case, because there was no place left outside the organ for a system based on wedge bellows. The swell box was kept as a useful addition. The organ is widely acclaimed for its mild tone and its expressive tremulants which make the instrument really suitable for the romantic style of compositions, especially the Dutch romantic (and post-romantic) music. 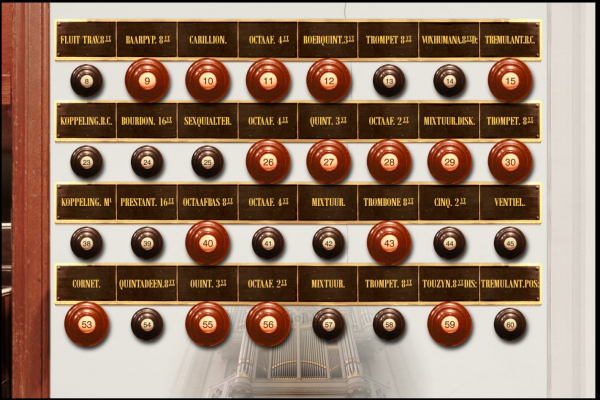 This time, recording the tremmed ranks was indispensable to preserve the special character of the instrument. Most of the ranks of the Ist and IIIrd manuals are, therefore, included also with the recorded tremmed ranks. The church building is really generous in space. It is however only a fraction of its original size, the great nave was destroyed in the past, so that only the Choir plus the Transept remains. The organ is positioned centrally in the back wall of the Transept. Perhaps because of this, the sound is rather diffused. This sample set is therefore really very "wet", unlike other sample sets from the Sonus Paradisi collection. The current version of the sample set is 2.5 (released 16th October, 2013). 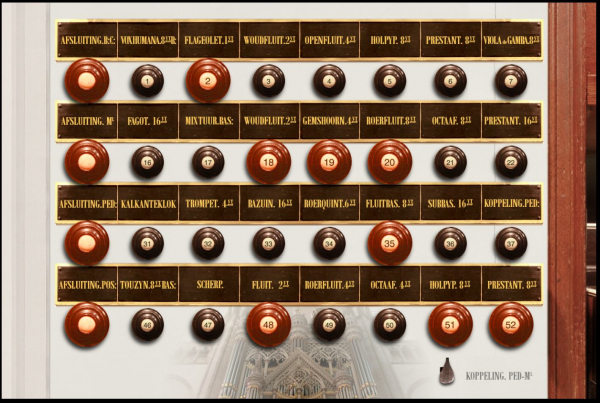 This virtual organ model requires Hauptwerk ver. 4 and above. The original compass of the manuals is 54 keys. The compass was extended virtually to 56 keys (v. 2.5). The pedal compass is 27 tones. The pedal compass was virtually extended up to the 30 tones. 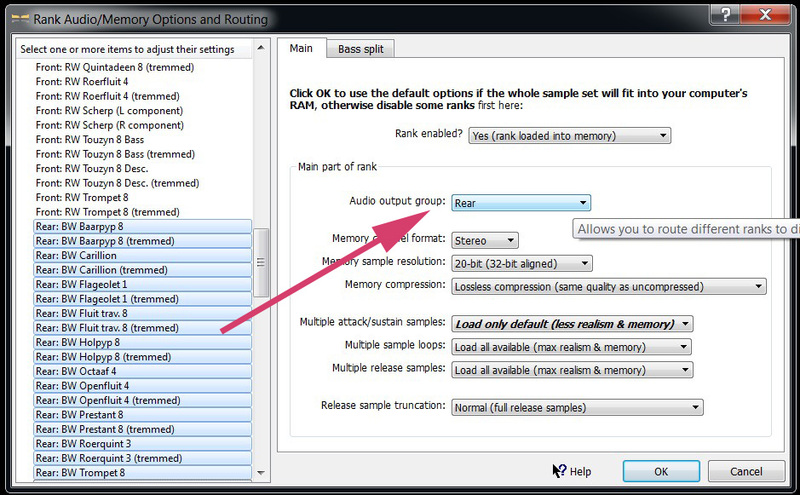 The samples are offered in 24bit/48kHz quality, multiple releases (3 levels). Plain wave formant (no encryption). The reverberation time is up to 6 seconds for the ambiental version. The sample set is offered in surround (four channels). 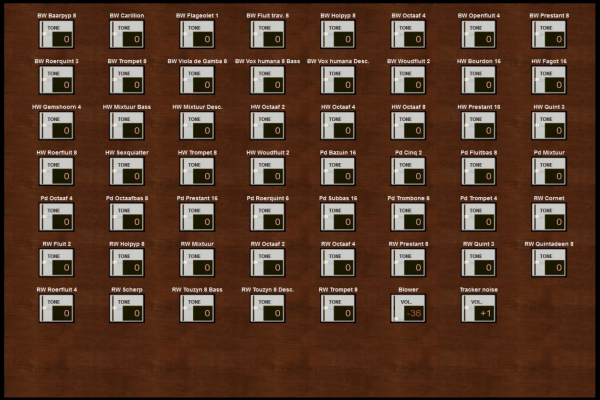 Many ranks of Positiv and Bovenwerk offer recorded tremmed samples (recorded tremulants). For use on 16 GB RAM machines, you may experiement with loading most of the sample set in 24 bit depth, but setting some ranks to 20 or 16 bit to save some RAM. Pedal ranks can usually safely be loaded in 16-bits. Nevertheless, 20-bit depth is recommended as the quality of audio in 20-bit is very good and mostly undistinguishable from 24-bit. 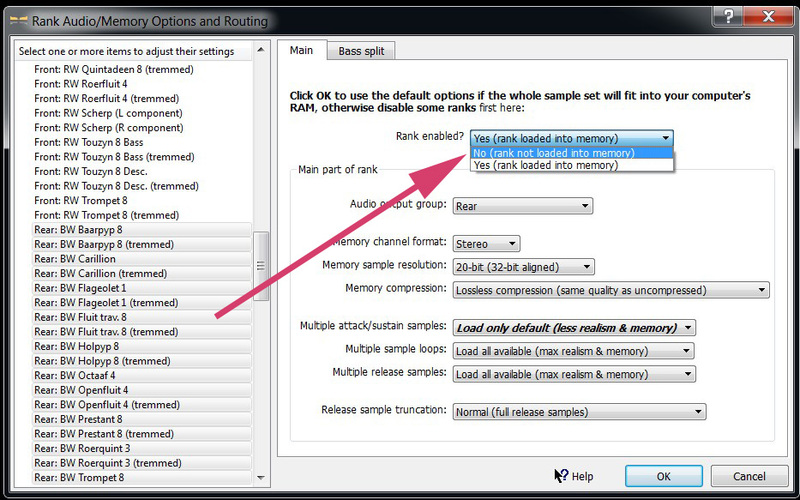 See the screenshot for an illustration how to identify the rear ranks (there are two kinds - a normal rear rank and a tremmed rear rank), all of these may be selected and muted (by clicking on the box near to the "Rank enabled?" question and selecting "No". Quint 3'k Octaaf 2'l Open fluit 4' Mixtuur 4 st.
Fluit 2' and Touzyn 8' = from1974. Hw: Sexquialter, Gemshoorn 4', Woudfluit 2' and Trompet 8' = from1974. P: Octaaf 4' 1571, Roerquint 6' from 1700. The drawstop called "Ventiel" is a device to empty the bellows. If drawn out, the hole to the main wind trunk is opened and the air easily escapes from bellows. The information about the organ compiled by Ir. Hendrik Kooiker E.I. 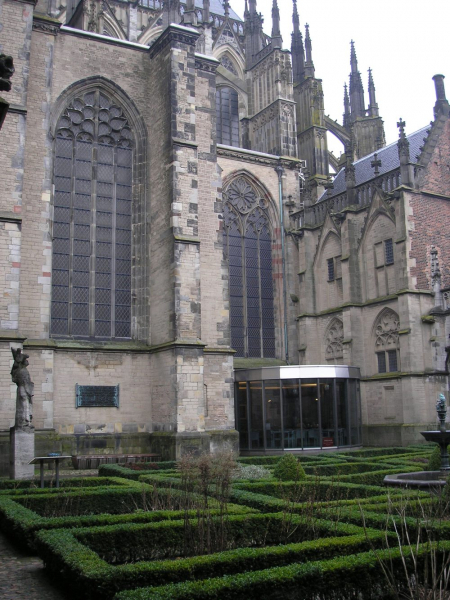 More photos of the Utrecht Domkerk and its organ courtesy of Jonathan van Ginkel. For more performance by Christoph Keller, please visit his Youtube channel. released 18. March 2017. The attack of several tones of HW Octave 8, Octave 4 and Sesquialtera and RW Octave 4 and Quinte 3 improved.